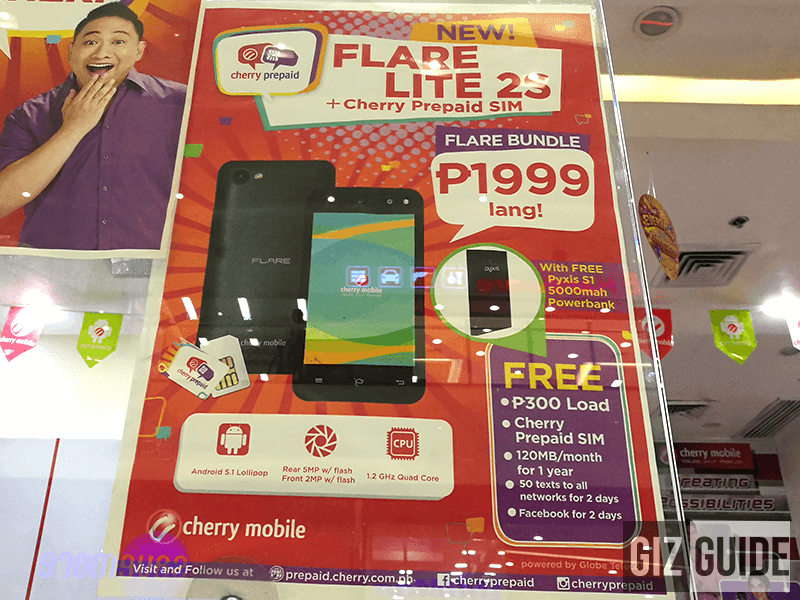 After the success of the Flare 799 bundle, Cherry Mobile has another trick on its sleeve. This time, they just introduced the Flare 1,999 bundle which includes the new Cherry Mobile Flare Lite 2S, Cherry Prepaid SIM, 300 Pesos load w/ data and a FREE Pyxis 5,000 mAh powerbank. In terms of specs, nothing much has changed except for the selfie camera, battery size and OS. It still has the same 4 inch WVGA screen, 1.2 GHz Spreadtrum SC7731 quad core processor, Mali 400 GPU, 512 MB RAM and 4 GB expandable ROM. However, the battery capacity is noticeably lower at 1,200 mAh coming from 1,400 mAh. Anyway, Cherry still slightly upgraded the device as it now has a better 2 MP front camera w/ LED flash coming from a VGA cam. It also now loads with Android 5.1 Lollipop OS out of the box for that better Android experience. It's now available in Cherry Mobile stores with an SRP of 1,999 Pesos.